I love making smoothies for my family. They are a delicious way to reach our daily quota of fruit and vegetables. They also make a wonderfully refreshing drink for a hot summer afternoon. Plus it is the only way I ever get any dark leafy green vegetables into my 2 year old. However, not all smoothies are created equal. Some are chock full of unnecessary added sugars. Others are nothing more than a big glass of carbohydrates, with no protein or fat to help keep you feeling full, and very little fiber to slow down the digestion of the fruit sugars. So how do you know if the smoothies you drink are healthy? Here are 10 rules for making a healthy smoothie. Many grocery stores sell frozen ‘smoothie kits’. They usually consist of cut fruit, corn starch, gums, as well as added sugars or fruit concentrates. Yes they do save about 5 minutes of smoothie-making time. But they also increase the already high-sugar content of a regular smoothie by adding even more sugar. The bottom line is this – fruit is FULL of sugar. There is no need to add more sugar to your smoothie besides the fresh fruit that you are already adding. If you want to save time making your smoothies (and who doesn’t want to save time?) buy bags of frozen fruit with no added sugars. But avoid the at-home smoothie kits. There is no reason why you cannot include fruits from the high-sugar category in your smoothie. Just try to include them in moderation, or mix them with some strawberries, raspberries, or blackberries to lower the overall sugar content. Dark leafy greens are an extremely nutritious and important part of any healthy diet. They are full of antioxidants, vitamins, and minerals, but very low in calories. They can help protect against cancer, cardiovascular disease, and even birth defects. It is therefore important to include them in your meals whenever you can. Throwing some raw leafy greens into your smoothie is an excellent way to add extra nutrition to your glass. And if you have children who are not so inclined to eat their vegetables, this is a great way to sneak some in. 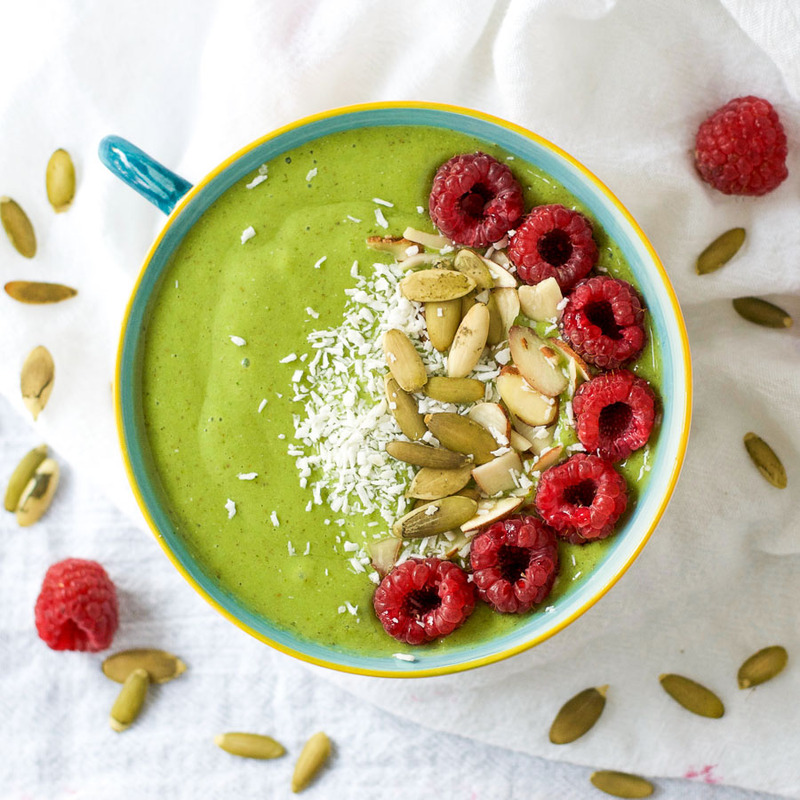 You can add any leafy greens you like, but spinach and kale are popular for smoothies because they are fairly neutral in flavor when added to the remaining ingredients. Some people like to add protein powder. However, I am of the view that it is best to eat the whole food whenever possible. By eating the whole food, you benefit from many other nutritious compounds. Fat is another nutrient that will help you feel full for longer. Eating a little fat at each meal can help curb your appetite and prevent overeating. Avocado is an excellent way to add healthy fat to a smoothie. It also creates a creamy consistency. You could also add chia seeds or flax seeds, both of which contain omega-3 fatty acids that have anti-inflammatory effects in the body. Many smoothie recipes call for added honey, agave, maple syrup, or other sweetener. However, fruit is an excellent source of natural sugars. There really is no need to add extra sweeteners to an already sweet fruit smoothie. When making a smoothie, try to avoid adding any extra sweeteners. And make sure any liquid base you use is unsweetened. And if you are feeling really adventurous, you could even add some fresh or ground turmeric to help fight inflammation and boost your immune system. 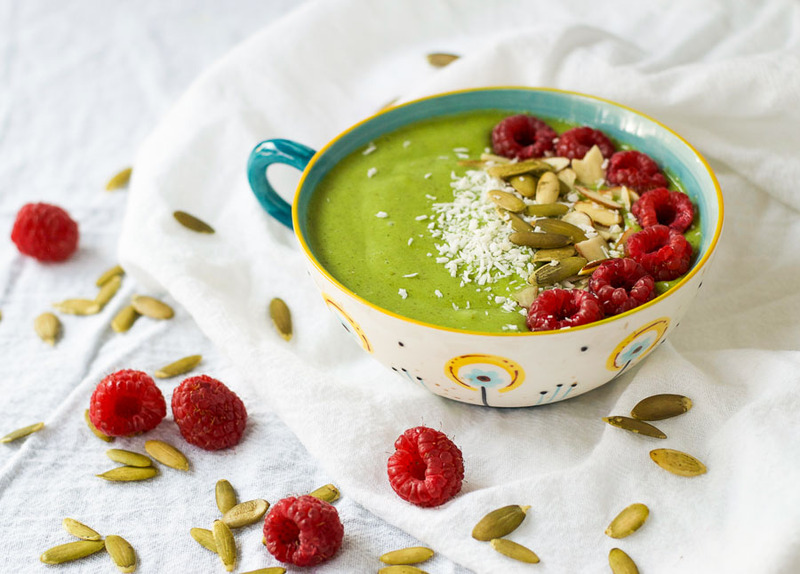 If you are looking for inspiration to get you started, try this deliciously simple kale, kefir and chia smoothie bowl. Pour into a bowl and add the toppings of your choice. Great suggestions and excited to try the recipe! I especially like the idea of adding protein (other than powder) and fiber. Thank you Deborah. Protein and fiber are definitely a great way to fill you up. You’re welcome Chris. Thanks for stopping by. I’ve been looking for smoothie recipes and want to start incorporating them into my morning routine- thanks for sharing! They are definitely a great way to get some fruits and vegetables into your breakfast… as long as you don’t add too much sugar. I totally agree with you. So many things you buy are full of chemicals and, unfortunately, the ingredients list is incomplete and unclear. Thank you for this recipe! Thank you for these useful tips! I love smoothies. You can drink at any time of the day. It is healthy and delicious. For me, it is a good way to eat enough fruit or vegetables. I like it that there are so many variations and flavors. I will definitely use you tips. Thanks for your dropping by Celine. Yes, smoothies are a great way to get extra fruits and veggies in your diet. It isn’t always easy to eat enough fresh produce.